On this day in dinosaurs, Andrey Avinoff, Director of the Carnegie Museum of Natural History, answers Barnum Brown’s letter. We discussed Brown’s offer in an earlier post, and Avinoff received Brown’s floated offer with a call for a more concrete proposal. 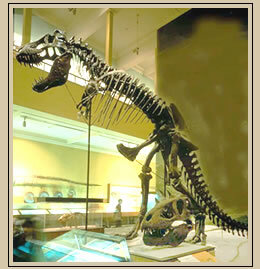 Avinoff gently declines Brown’s request to speak in Pittsburgh, and then while saying he is “keenly” interested in purchasing the Tyrannosaurus skeleton, makes “no immediate assurances that such a tempting possibility can materialize into a completed transaction.” Avinoff says a “definite proposition” would be “most carefully considered” by the Carnegie Museum. He then asks for the AMNH’s price for the T. rex. We’ll examine Brown’s response in due time, but while you’re waiting, we want to see your pictures with T. rex! Share them with us on Facebook and Twitter using the hashtag #TDIDinos.